The Guardian reports that the Mayor of London (and probably Britain’s most popular Conservative politician, a possible replacement for Prime Minister David Cameron) has issued a strong condemnation of the former prime minister’s views on the Middle East. 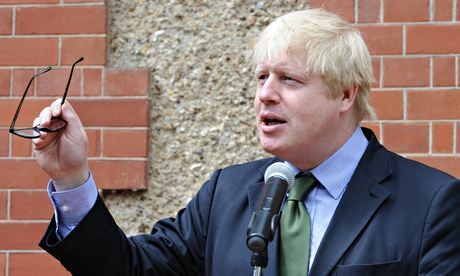 Boris Johnson, (seen left) said the former prime minister is unhinged in his attempt to rewrite history and is undermining arguments for western intervention in Iraq, the London mayor claimed in an extraordinary personal attack on the former Prime Minister. (Photograph: Stuart C Wilson/Getty)Blair took to the media over the weekend to make the case for a tough response to the extremist insurgency in Iraq, insisting it was caused by a failure to deal with the Syria crisis rather than the 2003 US-led invasion which he helped to instigate.His intervention was met with widespread criticism from Labour figures and others as extremists posted pictures apparently showing the killing of dozens of Iraqi soldiers by jihadist fighters. In his condemnation of Blair the London Mayor accused the ex-Labour leader of having sent British forces into the bloody conflict in part to gain personal “grandeur”. Exactly echoing what we said a couple of days ago, Johnson said in his Daily Telegraph column that Blair and then-US president George Bush had shown “unbelievable arrogance” to believe toppling Saddam Hussein would not result in instability which resulted directly to the deaths of 100,000 Iraqis and hundreds of British and American troops. In fact, the figure of Iraqi losses is well over 500,000, according to a range of impeccable sources. He suggested there were “specific and targeted” actions that could be taken by the US and its allies to deal with latest threat – as Barack Obama considers a range of military options short of ground troops. But he said that by refusing to accept that the 2003 war was “a tragic mistake”, “Blair is now undermining the very cause he advocates: the possibility of serious and effective intervention. “Somebody needs to get on to Tony Blair and tell him to put a sock in it, or at least to accept the reality of the disaster he helped to engender. Then he might be worth hearing,” Johnson concluded. And he is exactly right. Unhinged? You be the judge. As to whether Blair is actually unhinged, we couldn’t possibly say. But there is something about the messianic glare that overcomes his eyes when he is defending his position that we find quite disturbing to watch. The row over the events of 11 years ago came amid suggestions of serious atrocities being committed in the militants’ advance. Taking on critics in an eight-page essay on his website, Blair rejected as “bizarre” claims that Iraq might be more stable today if he had not helped topple Saddam. The former premier – now a Middle East peace envoy – said Iraq was “in mortal danger”, but pinned the blame on the sectarianism of the al-Maliki government and the spread of Syria’s brutal three-year civil war, not on the instability created by the West’s invasion of Iraq. Former foreign minister and United Nations Depity Secretary-general Lord Malloch Brown urged Blair to “stay quiet” because his presence in the debate was driving people to oppose what might be the necessary response. Clare Short, one of a number of MPs who quit Blair’s cabinet over the 2003 invasion, said he had been “absolutely, consistently wrong, wrong, wrong” on the issue, and opposed more strikes.